"Geodesign is both an ancient idea and a new idea supported by new and advancing technology," said Esri president Jack Dangermond as he welcomed more than 300 people from around the world to the 2015 Geodesign Summit in Redlands, California. "I see GIS integrating into almost anything we do." Because the ArcGIS Data Interoperability extension now natively supports Minecraft formats, the data can also be read back. "So if you set up a project like this where you invite players to rebuild a world, you can compare (worlds) before and after and just take out the pieces that have changed and bring them back to a GIS system such as [Esri] CityEngine," Månsson said. 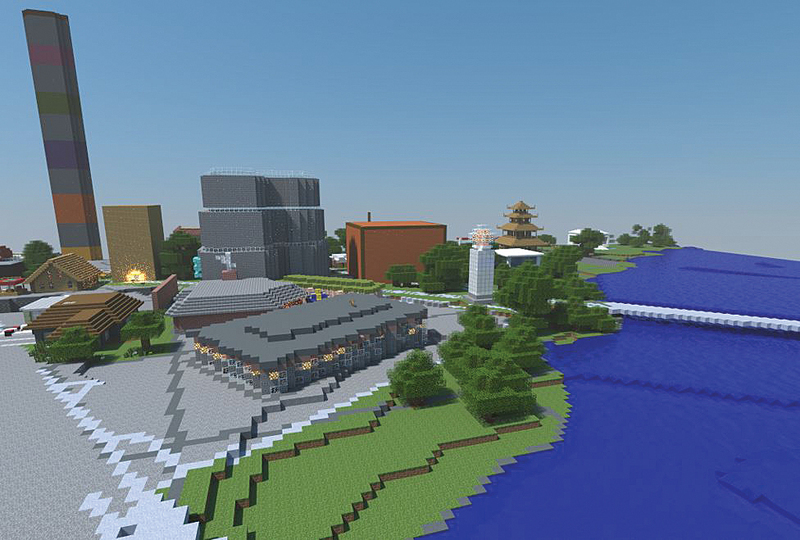 "You could go from a CityEngine model to Minecraft, have it edited there, and then bring those edits back to CityEngine." In ArcScene, an application that is part of the ArcGIS 3D Analyst extension, Minicozzi's maps showed the taxable value per acre of land as elevations. He showed a map of Travis County, Texas. The highest extrusion was located in downtown Austin, the county seat. Another map showed a high spike for alcohol sales in downtown versus the mall areas in the suburbs. Esri has worked hard to develop new and nimble geodesign tools including GeoPlanner for ArcGIS, the ArcGIS Pro application in ArcGIS for Desktop, and Esri CityEngine. Esri's Rob Matthews used the tools in GeoPlanner for ArcGIS to create a hypothetical Bus Rapid Transit (BRT) route through downtown San Diego, California, leveraging a geodesign approach. He used the app's tools to study planning issues at multiple scales, from a city-wide BRT routing to the fine-grained placement of stations and the evaluation of land-use regulations to support Transit Oriented Development (TOD) at the site scale. He also demonstrated the app's capability to do live analysis in the cloud, such as walk times from proposed BRT stations, design schemes with enriched curated demographic data, and suitability for BRT station placement using a weighted raster overlay service. He demonstrated how the app can be used to compare project alternatives using a dashboard for key performance indicators. Finally, he prepared a higher density development option to export to ArcGIS Pro for further refinement in 3D. Esri's Nathan Shephard used ArcGIS Pro to take this downtown San Diego design to a larger scale. Existing 3D buildings (courtesy of Pictometry) provided context around potential building development sites. A proposed building outline was digitized in 2D using precision editing tools. A synchronized 3D view rendered the simple shape as a constructed 3D building—complete with realistic texturing. 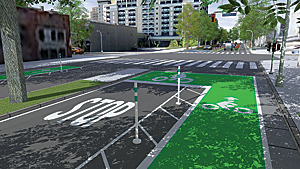 Using data from Shephard's downtown San Diego demonstration, Patrick showed the audience Complete Streets, a procedural street sample that incorporates knowledge and ideas from transportation planning guidelines and standards, to generate a default street, then added 2.5-meter-wide bike lanes with 1.2 meter buffers for each lane and planters, curbs, and trees. 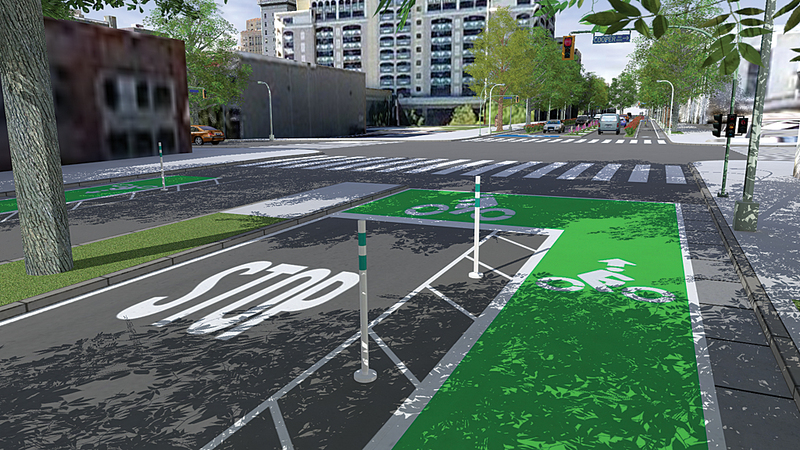 Not only can Complete Streets be used to visualize the bike lanes, curbs, and trees in 3D, it can also generate analytical reports on various aspects of the street's geometry that are useful in coming up with rough cost estimates for construction work.